I have realized that Liberating Structures are helping me with being a more successful ScrumMaster. I have written about my experienced benefits of Liberating Structures as concept, as well as links to useful resources in the first post of this series. This post is about my experiences and reflection on a specific Liberating Structure. The primary reason for writing about it is for the sake of my own reflection. If you can use it as well, that’s awesome. Also, if you disagree, have questions, or if you spot room for improvement, don’t hesitate to comment. The team had previously identified the need of having a Definition of Ready. Previous attempts in making a Definition of Ready has resulted in a poor list, which the team stopped referring to quickly after the meeting. And when a team member mentioned the need of a Definition of Ready, heated and unfruitful discussions emerged about should we have it or not? ; What should it contain, and what not? As a Scrum Master I needed to find a way to facilitate a discussion that gave everybody equal possibility of contributing; a feeling of being heard; ownership for decisions made, as well as doing it effectively, to avoid wasting time of worthless discussions. 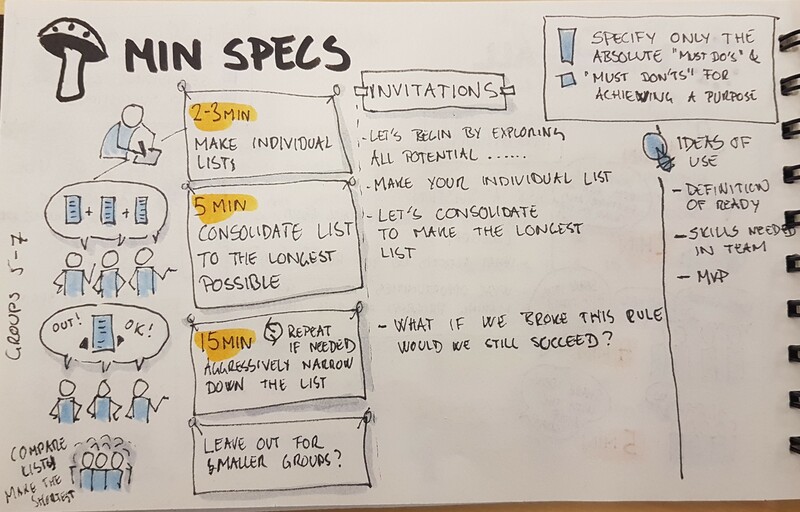 The “Min Spec” is designed to Specify only the absolute “must do’s” and “must not do’s” for achieving a specific purpose so I chose this for the Team’s Definition of Ready workshop. I highly recommend to read the original Min Spec description from the inventors, which I used as basis for this Definition of Ready workshop. Below I have listed the steps I went through, along with my reflections. This step is not actually a part of the Min Specs, but I chose to do it, to get participants in the right mood for the session. It also gave the team a common purpose for the session, so discussions about “Do we need it at all?” was not broad up during the rest of the meeting, as previously experienced. Participants were using sticky notes and markers. The making of individual list gave participants time to reflect on their own, and a chance to work with their contributions, before having to speak out. Invitation: “Let’s consolidate the individual list to make one long list, as long as possible. Duplicates are removed” (5 min). This question was the turnaround for the team. The team discussed each item one by one, in beginning with too many details, but after a reminder to be “more aggressive” the pace became faster. This made room for discussing the important things, rather than wasting time on things the team already agreed. The team realised during the talk, that removal of an item, didn’t mean “Not important” or “Irrelevant”, It just meant, it is “not a must do”. This realisation led to changing the wordings on some items, turning them into must-do-action, and thereby more relevant for the team. At the end, the team owned the list. It was theirs. It made sense to them, because they could see how being strict about following this list would make them do only the bare minimum effort for making a story, but still leaving room for doing more if relevant for that specific story. In other words, the list was not limiting the team, it was fostering the open and creative dialogue needed to come up with better solutions. As closing it was enough just to sum up what the team already felt. This is now my go-to process for Definitions of ready/Done. I also intend to use this approach for MVP discussions, and for discussing skills needed when looking for a new team member. Seem like a big responsibility, and if the list makes you feel a bit anxious, I perfectly understand it, because I feel the same way. Yet, I need to say, there is more to it. Today’s world is changing faster than ever, and everybody needs to move faster. This also calls for a need to be able to foster “Creativity and Innovation” when facilitating. Did you lose your breath now? I almost did, just by writing it! When it comes to facilitating retrospectives, I have a decent toolbox to pick from to achieve some or all from the list above. However, I have been struggling to find ways on how to ensure equal contribution, ownership for decisions, efficient processes and room for creative thinking, outside of the retrospective. Søren Weiss, who is an agile coach, change agent and someone who inspires me a lot, introduced me to Liberating structures. It changed everything. Looking back at the situation before I was introduced to Liberating Structures my “go to methods” was not as effective, as I could wish for, and I can now identify some of the patterns, that weren’t helping me. I tried different things, with some success, but still ending in this pattern, or variations of it. Presenting my thoughts and my perception of the situation which justifies my selection for processes and activities. I am the only one talking, and I don’t get to hear the team members perception of the situation. And then I ask the team about their perception to have an open discussion. It tends to be words of the most outspoken people that often shapes the next steps. Leaving the uncertainty: Did we really explore all options? Then I tend to manage the discussion by asking specific people about their opinion. Then I’m suddenly in charge of who can speak and when. And since I don’t know what everybody is thinking, how can I ensure that people get to talk when they have something on their mind? So, what is Liberating Structures? It was almost to good to be true, but after reading about it, and trying a few of the structures on my own in smaller group I must say, that so far Liberating Structures live up to what they promise. I can’t wait to expand the use in larger groups, once I get a chance. If you are a ScrumMaster, Team coach, Agile Coach or facilitator, the chances are high that you’ll find these structures valuable to your work too. If you want to know more about the concept of Liberating Structures, I suggest that you go to liberatingstructures.com for the original source, or visit “The liberators” and their introduction to liberating structures. When preparing for a session or workshop, don’t plan to control content. Plan to achieve a purpose and not to get to a specific conclusion. During facilitation, make the invite, and step back. Let the group unfold. Liberating structures breaks the limits of conventional meeting structures such as presentations, open discussions, and managed discussion by removing limitations and barrier for contributing – Awesome! I’m still exploring the concept of Liberating structures and trying to figure out how I can use them in my daily work as a ScrumMaster. I see the potential to use them not only in retrospectives, but other Scrum ceremonies, group discussions, department meetings etc. In the following posts on this blog I will write my reflections on my experience with the Liberating Structures that I have tried so far, and how I have used them in my daily work as ScrumMaster. What will the manager answer? Story 1 is one I made up (kind of), and story 2 I was told by a friend of mine, when he wanted my opinion on the topic “Storypoint inflation”. Putting it as simple as in story 1, most people will believe B is the best answer – without hesitation – and will not accept the suggested solution to just devalue the story points. But story 2 seems to appear more often, even though the only difference compared to story 1, is the speed of story point inflation. So why does it happen? Before I elaborate on that I will say that I see indications of a company not having an agile mindset – They might be “doing agile” rather than “being agile”. That will be wrong for me to conclude with my limited knowledge about their situation, and it will be naive to think that a few words about “Storypoint inflation” and “Commitment” could solve their challenges. Having said that, I still believe that these few words on the topic, could be a first small step, to changing the mindset in an organization like that. And here is how I would go by it as a ScrumMaster. Coaching the team and the manager to believe the “sprint commitment” is a forecast rather than a promise. Ensuring storypoint estimates are for the team, and the team only! Fulfilling the managers need for measuring effectiveness. If the manager, the product owner, or a team member, or anybody else for that matter, treat sprint commitment as a “promise of delivery”, “commitment” is not used as intended. In software development we never build something that we have done before. Therefore I find it difficult to believe that we can foresee everything, and that makes it hard to make a “promise to deliver”. Though, it should still be the goal to deliver. We should have the intention of delivering, including considering and talking about what makes it possible or not. Coaching the team and people around the team to use “Forecast” instead of “Commitment” (as a promise to deliver) can give the team the space they need to focus on developing good software. If the manager is still in a need to know about progress, and when the team can deliver, Invite him/her to join a demo, so he/she can see the product. After all, the primary measure of progress should be working software. Storypoints is NOT a metric for measuring effectiveness, and it should NOT be used for reporting to management. I can’t state this clear enough. Nevertheless, this seems to be the case a lot of places. I think it´s because storypoint estimates are numbers, that are easy to work with, if you come from a traditional way of working with projects. But this way of using storypoints, causes some uintended problematic behaviour. So, what to do about it? Storypoint estimation is a tool for the team. It serves two main purposes. It is a tool to get a good dialogue going in the team, and it is a tool for forecasting. Everybody around the team must understand that the estimates made by the team, is for the team only. Any interferences with the estimate and/or estimation process from someone outside the team, is in risk of resulting in storypoint inflation. Does a team even need storypoint estimation? No! If the team have sufficient dialogue, and is able to make forecasts to managers and other stakeholders, the team does not need to do estimates at all. One way of finding out, if the team needs it, is by stop doing it, for a fixed timebox, and then evaluate. If not all aspects are covered during team dialouge, it might be a good idea to use Storypoint estimation. So now we have made the manager and other stakeholders understands that a “forecast” is something we aim for, which is not the same as a promise. The team are now estimating storypoints only for the purpose of the teams own dialogue, and as a tool for forecasting, and only if they benefit from it themselves. But the manager still needs to report to his manager how effective the team is working and now we’ve just left him hanging there. Some might argue that is should not be needed for the manager to know this, or that managers are not needed at all, but I’ll bet you will have a hard time explaining this to the manager. And if we cannot change the organisation, we have to deal with it somehow. So, what if the manger asks: “How effective is the team at this point?”, and the team could answer “We’re at 87%”, Would that work?